I’ve had a lot of candidates lately tell me they are interested in making a career transition or are open to considering new roles beyond their existing skill set. While I’m usually a fan of Gumby-like flexibility, it pains me to say now is not the time for plasticity. Here’s why: the economy still stinks; therefore, organizations are taking very few risks when it comes to hiring. This means they are hiring people who have backgrounds that very closely match the openings on hand. If you’re old enough to remember Gumby (and, ahem, I’m only old enough to remember Eddie Murphy’s rendition of him), you remember when the economy was good. Ok, maybe it hasn’t been that long. The point is that in the good ol’ days, organizations had the luxury of taking hiring risks. For instance, they might hire a private sector salesman for a fundraising role. Or, they might hire an individual with a lot of creativity, strong writing skills, and not a lick of specific communications experience for a communications manager role. They made calculated risks; and while many of those bets paid off, they could afford it when one crashed and burned. But now organizations are more risk-averse. They are insisting on candidates who have already held similar positions. If they ask me for a major gifts officer, they want someone who has major gifts experience in a nonprofit setting. If they ask me for an executive, they want a nonprofit manager with proven leadership experience. 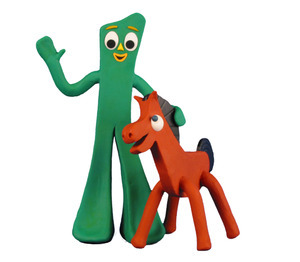 So, I hear you, my dear candidates, when you say, “I’m Gumby, Dammit!” But let’s save that pliability for a little later when the economy improves.